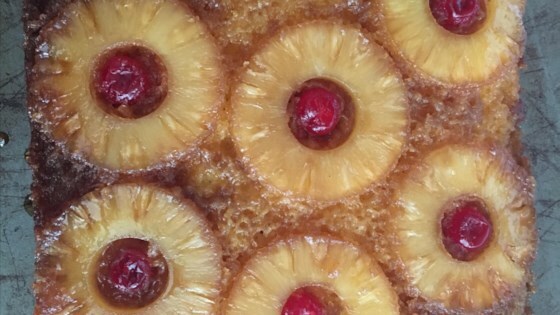 "This pineapple upside down cake is made in an iron skillet. It's quick, easy and so beautiful." Melt the butter over medium high heat in the iron skillet. Remove from the heat and sprinkle the brown sugar evenly to cover the butter. Next, arrange pineapple rings around the bottom of the pan, one layer deep. Place a maraschino cherry into the center of each pineapple ring. Prepare the cake mix as directed by the manufacturer, substitute some of the pineapple juice for some of the liquid in the directions. Pour the batter over the pineapple layer. Bake as directed by the cake mix directions. Cool for 10 minutes, then carefully turn out onto a plate. Do not let the cake cool too much or it will be stuck to the pan. I do not have an iron skillet, so I made it in a regular 9 by 13 cake pan and it was fantastic.